Actor-filmmaker Prakash Raj has threatened to return his five National Film Awards while questioning PM Narendra Modi’s silence on the murder of journalist Gauri Lankesh. Prakash said, “I am a renowned actor, do you (Modi) think I will not be able to detect when you are acting,” He added that it is distressing that there are people celebrating her death. Actor Prakash Raj hit out at Prime Minister Narendra Modi for his silence on journalist Gauri Lankesh’s murder and said that politicians deserved his national awards more than he did. Speaking at the inauguration of the 11th State meet of the Democratic Youth Federation of India, Prakash Raj hit out at Prime Minister Narendra Modi for being silent on journalist Gauri Lankesh’s murder, and those supporters of the right wing who have been celebrating the murder on social media. “Gauri’s killers may not have been caught yet but what is more distressing is those who celebrated her death. We may not be able to see Gauri’s killers but we can see those who have spewed vitriol,” the actor said. “People who our Prime Minister follows are also among them. We have a Prime Minister who shuts his eyes to this,” he added. “I am a renowned actor, do you (Modi) think I will not be able to detect when you are acting. At least show me some respect, considering the fact that I am an actor and I will be able to tell what is the truth and what is acting,” he lashed out. Watch Prakash Raj’s speech from 10.00 onwards. For his comments on Gauri Lankesh, watch from 21.00 onwards. A multi-lingual actor and producer with a fan base across south India, Prakash Raj was a close friend of journalist Gauri Lankesh for over three decades. “Gauri’s father, Mr Lankesh, was our mentor, our teacher. We have been his students, and I knew Gauri for the last 35 years,” he told Republic TV soon after Gauri’s death. Prakash had also said that though there were many vocal voices in the past such as Lankesh, DR Nagaraj and UR Ananthamurthy, intolerance for such voices had grown more recently. “I am really wondering where are we going towards?” Prakash asked. 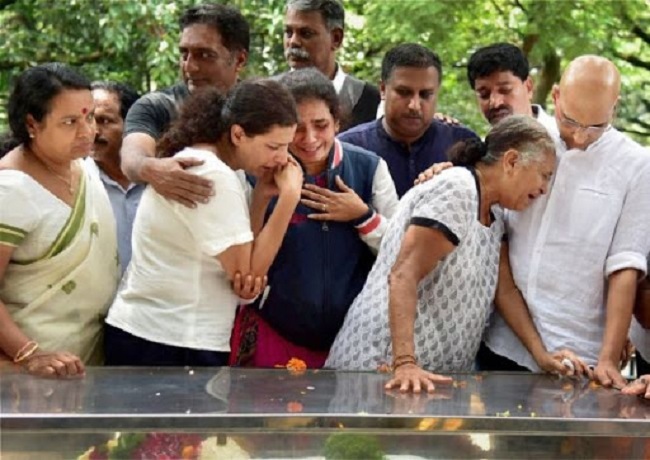 Image courtesy: PTI/ Prakash Raj with Gauri Lankesh’s family at her funeral. “Who has done it is supposed to be left to the police and the CB/CID, whoever is going to do it. But then we know, I think we as a country, as citizens, we have not decided that who should rule us, who are the policy makers, and who has let this sort of an ambience sneak into our lives,” the actor went on to say. “That is exactly what is terrifying. That it is happening continuously. And whoever the cowards are, they are unabashedly trying to challenge the system, challenge our conscience and say, ‘We can silence voices.’ Whoever is reasoning, and the whole Freedom of Expression, having a right to express, is trying to be questioned,” he said. Prakash Raj has won 5 National Awards for films across industries in his long career. These are Best Supporting Actor for Iruvar (1997, Tamil), Special Jury Award for Anthapuram (1999,Telugu), Special Jury Award for various movies (2003, multiple languages), Best Actor for Kanchivaram (2007, Tamil), and Best Film for Puttakkana Highway (2010, Kannada).